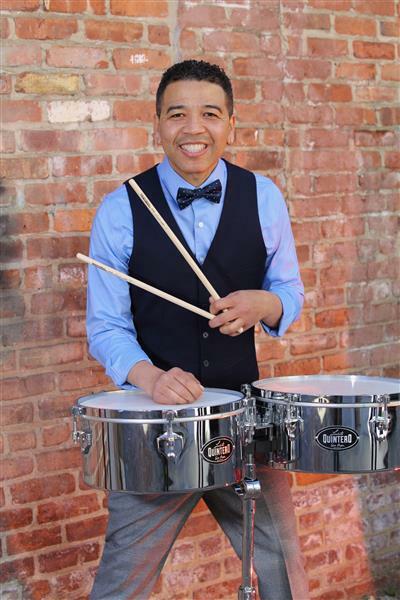 Master Timbalero Luisito Quintero hails from Caracas, Venezuela, where his father, a respected percussionist in his own right, tutored and encouraged his son to become one of music’s best percussionists. Luisito comes from a long line of outstanding musicians including his uncle, Carlos Nene Quintero and cousin Robert Quintero. He studied at the respected Orquesta Simfonica de Venezuela (The Symphonic Orchestra of Venezuela) and his percussion technique soon garnered attention from his colleagues. Luisito joined the popular music ensembles Grupo Guaco and Oscar D'Leon, where he enjoyed worldwide acclaim. Luisito Quintero has worked and recorded with many of music’s legends including The Rolling Stones, Vanessa Williams, Paul Simon, Santana, Jack De Johnette, David Sanborn, George Benson, Joe Sample, Bill Cosby, the late Celia Cruz and Tito Puente, Cachao, Eddie Palmieri, Marc Anthony, Gloria Estefan, Richard Bona, Ravi Coltrane, Nathalie Cole, Diana Krall, Giovanni Hidalgo, Toshiko Akiyoshi, Spanish Harlem, Willie Colon and countless others. One of his recent projects finds him as musical director for Louie Vega and the Elements of Life Band, as well as extensive work with Jack DeJohnette's Latin Project. He has also had the privilege to tour and record with the Tony & Grammy award winning Jazz artist, Dee Dee Bridgewater. Quintero himself has earned more than thirteen Grammy certificate awards for his participation in numerous recordings. Luisito Quintero has two solo projects under Vega Records/BBE, entitled "Percussion Maddness" and "Percussion Maddness Revisited". Scheduled for release in the spring of 2013, his upcoming production entitled “3rd Element”, features guest artists Gato Barbieri, Oscar Hernandez, Doug Beavers, Richie Flores, Steve Khan, Reynaldo Jorge and his cousin Roberto Quintero. Currently, Luisito is the touring percussionist for the legendary jazz pianist Chick Corea.